Today begins the fourth year of my Thirty Days of Gratitude. I started this series/tradition in 2012 (and, actually, before that on Facebook) because I was annoyed by the Christmas advertising and store displays that appeared before Halloween. I think that such promotion encourages us to think past November to Christmas and gift-giving, and we overlook or give short shrift to Thanksgiving. I have always loved Thanksgiving. When I was a kid, we always had two Thanksgiving dinners: one the night before Thanksgiving at my great aunt and great uncle’s house (my great aunt was like a grandmother to me) with the big family crowd, and then one with my mom, brother, aunt, uncle, and two cousins. The food was amazing, and we always laughed a lot. In addition, Thanksgiving is a time to express gratitude for the wonderful lives we have. Even when facing adversity, there is comfort in being with family and friends. I try to always express gratitude for the blessings in my life, but Thanksgiving is a day specifically set aside for just that. And, maybe especially this year, I feel like expressing gratitude is important. This has been a dark, long election “season” (I hesitate to use that term because it’s been going on forever) and there’s been a lot of rhetoric about how bad everything is. Regardless of your political bent (which I do NOT want to get into here), I think we can all agree that we have much to be thankful for, and it’d be nice to focus on THAT for a while. And, with that, the Thirty Days of Gratitude Project began. Please join me, starting today. Each day, I will talk about something I am thankful for – small or large, silly or serious. Think about what you are grateful for in your lives and feel free to share in the comments today or any time during the month of November. 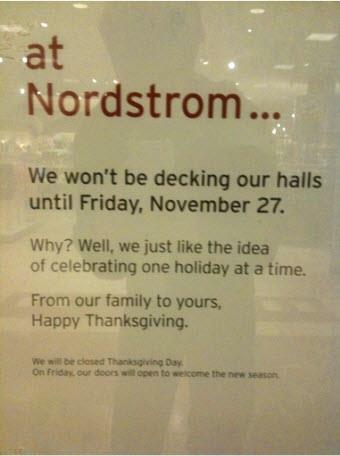 YEASSSS I am Thankful for Nordstrom. If I buy store bought gifts, they will be from Nordstrom and this is exactly why!! Thank you for posting this. It pleases me to see that there still a store that allows each holiday to be enjoyed before embarking upon Christmas. Isn’t it awesome? I’m glad that at least some stores are deciding to be closed on Thanksgiving. It’s a shame that’s such a rarity these days, but I’m glad that some stores are being sane and kind about it! I am grateful for the beautiful view I have every morning I wake up in the Texas Hill Country. Of course, there are many more things, but that starts my day. I think that’s the perfect gratitude, then! Thank you for sharing it!